Ohio Valley Publishing’s Point Pleasant Register took home a second place award for Best Special Section in Division 2 for its “Remembering the Silver Bridge Tragedy, 50 years later.” These commemorative pages were printed in the Dec. 15, 2017 editions of the Point Pleasant Register, The Daily Sentinel and Gallipolis Daily Tribune. OVP staff from its three publications contributed to this special section. CHARLESTON, W.Va. — Ohio Valley Publishing has been recognized with three awards from the West Virginia Press Association and its annual Better Newspaper Contest. Editorial awards were presented over the weekend in Charleston, W.Va.
Newspapers across the state of West Virginia competed in four circulation groups, two each for daily and weekly newspapers. The contest had 29 categories, ranging from Coverage of Government Affairs to Reporting Generated from Public Notices and Best Editorial Page. 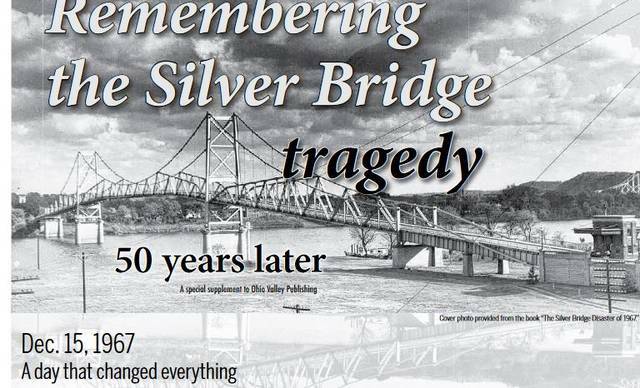 Ohio Valley Publishing’s Point Pleasant Register took home a second place award for Best Special Section in Division 2 for its “Remembering the Silver Bridge Tragedy, 50 years later.” These commemorative pages were printed in the Dec. 15, 2017 editions of the Register, The Daily Sentinel and Gallipolis Daily Tribune. OVP staff from its three publications contributed to this special section. In 2018, 36 newspapers submitted nearly 1,700 entries. The overall awards for General Excellence are based on total points earned in the basic categories. For General Excellence, the West Virginia Press Association recognized three places in each division. Four West Virginia newspapers earned first-place General Excellence awards, which honor outstanding achievement by circulation division, in the 2018 West Virginia Press Association Better Newspaper Contest. The General Excellence Award winners were Charleston Gazette-Mail in Division 1, Bluefield Daily Telegraph in Division 2, Hampshire Review in Division 3, and The Record Delta of Buckhannon in Division 4. With the top point total in both editorial and advertising of newspapers in West Virginia, The Herald-Dispatch of Huntington earned the Newspaper of the Year honors. Perry Nardo, publisher of Wheeling News-Register and The Intelligencer, won the WVPA’s highest honor — The Adam R. Kelly Award — for his outstanding dedication to the newspaper industry, the West Virginia Press Association and his local community. Nardo, a long-time publisher with the Ogden Newspaper Company, is a former prep coach at Shadyside High School and Bishop Donahue High School. He is a past president and board member with the WVPA. He also served as publisher of the Wetzel Chronicle in New Martinsville. He and his wife, Jayme, live in the Ohio Valley. https://www.mydailysentinel.com/wp-content/uploads/sites/14/2018/08/web1_snip.jpgOhio Valley Publishing’s Point Pleasant Register took home a second place award for Best Special Section in Division 2 for its “Remembering the Silver Bridge Tragedy, 50 years later.” These commemorative pages were printed in the Dec. 15, 2017 editions of the Point Pleasant Register, The Daily Sentinel and Gallipolis Daily Tribune. OVP staff from its three publications contributed to this special section.